Comments: Founded in 2000 by Professor Mick Moloney, The Washington Square Harp and Shamrock Orchestra (or WSHSO, for short) is based at New York University and made up of musicians from the Citys Irish music community. 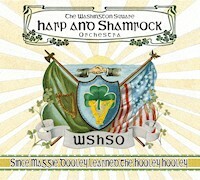 The WSHSO plays traditional Irish music and recalls the Irish-American dance bands of the early twentieth century, like The Four Provinces Orchestra, Dan Sullivans Shamrock Band, Pat Roches Harp and Shamrock Orchestra, and Erins Pride Orchestra. Write about Since Maggie Dooley Learned The Hooley Hooley! Want to write a review about The Washington Square Harp And Shamrock Orchestra's Since Maggie Dooley Learned The Hooley Hooley album? Post your comments in this box to be displayed in our community forums and in our album database! Please make sure you are logged in before proceeding. Please login to write your comments about Since Maggie Dooley Learned The Hooley Hooley.